I spent about two hours today making a new veneer scraper. The differences between this one and the one I made several years ago are that this one is made from black walnut, it was all that I had on hand, and the iron is positioned at a 20 degree angle to the anvil. The first one I made the iron was at a right angle to the anvil. 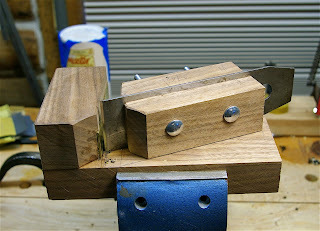 I changed the angles in an experiment in hopes that this scraper won't tear out/blow out curly maple. I had almost disastrous results last time I scraped curly maple with the first scraper I made. Click here to see my first scraper. If I had had some nice Douglas fir I would have used that, but this walnut sure looks nice. I glued up purfling strips of curly maple to ebony binding yesterday, this is going on the redwood/Indian rosewood Hernandez y Aguado guitar. I want this guitar to turn out nice, it is going to be a wonderfully responsive guitar with a very loud, lyrical voice. It needs to look as beautiful as it sounds, therefore I need to step up to the plate and do even better than my best. After testing this new scraper, I used the ebony/maple bindings, I really don't see a difference between the two scrapers other that this new one is a little smoother, perhaps the density of the walnut absorbs the vibrations better than Douglas fir. 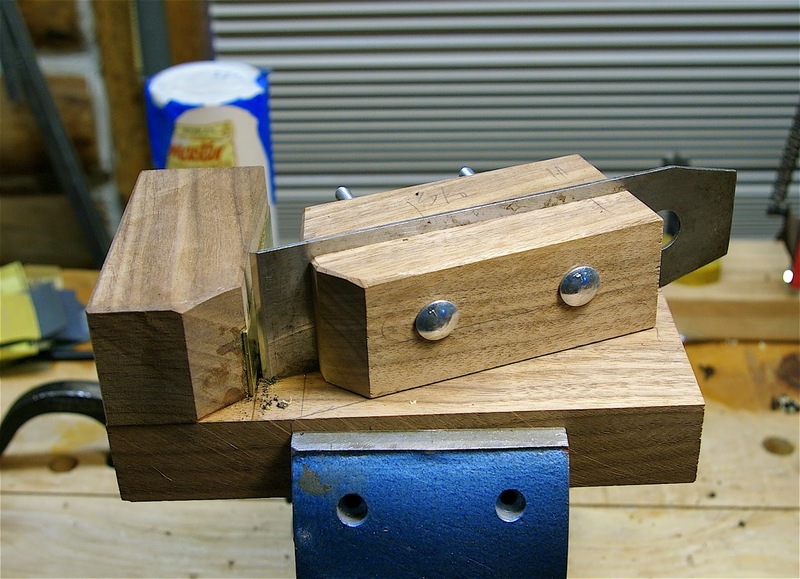 In Eugene Clark's article on make a scraper that appeared in an issue of American Lutherie, stated that you don't need to angle the iron in order for the scraper to work properly. In nearly all the old photos that I have seen of the interiors of the great Madrid guitar makers' workshops, all the hand made scrapers have the iron at an 10 degree or greater angle to the anvil. You all see that in Diderot's tomes, also. And Moxon's. They must have angled the iron for a reason. Here is a YouTube of one of my favorite guitarists, Ottmar Liebert and Luna Negra. I discovered Mr. Liebert's music back in 1990 when I was living and working as a park ranger at Hubbell Trading Post National Historic Site, Ganado, Arizona. I often listen to his music when I am working in my studio! Hey Wilson, thanks for the recommendation for Ottmar Liebert and Luna Negra - just cost me one arm and one leg at iTunes to plunder his back catalog :). At least the veneer scraper will be cheap enough since I already have wood and a spare plane blade. 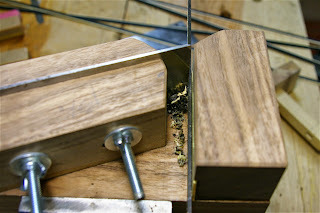 If you can find the time to do a blog post on how you select wood for your guitars, I'm sure I'm not the only one who'd appreciate it.